One of the great things about the Raspberry Pi Foundation is you never know what they are going to do next. In November 2014, they released a + version of the Model A. It has the extended GPIO pins (40) of its big sister the B+. 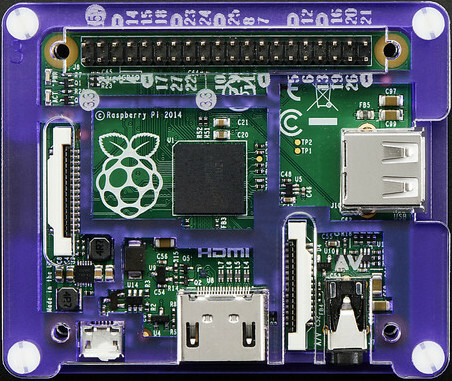 It is also smaller than any other Pi at 65mm in length. In order to shrink the footprint, the A+ has no Ethernet port, a single USB port, and 256MB of SDRAM. This not only reduces the physical size of the device, but also the amount of power it consumes. I recently purchased an A+ with the very cool Pibow Royale enclosure. What a beautiful combination of high tech and art. I am sure many folks are wondering why bother with a a Pi that is so… ‘legacy.’ For me, this is exactly what I was looking for. Small, simple, lightweight, and capable. Trying to jam the original Pi’s into security camera enclosures has been a headache for me. Not anymore. Also, the low power requirements of the A+ make it much easier to power the device for long periods of time using batteries or solar power. The folks at the Raspberry Pi Foundation are not only mad scientists – but geniuses as well. Tip of the hat to you all. Stay tuned for some of the great projects I plan for this fantastic Pi.